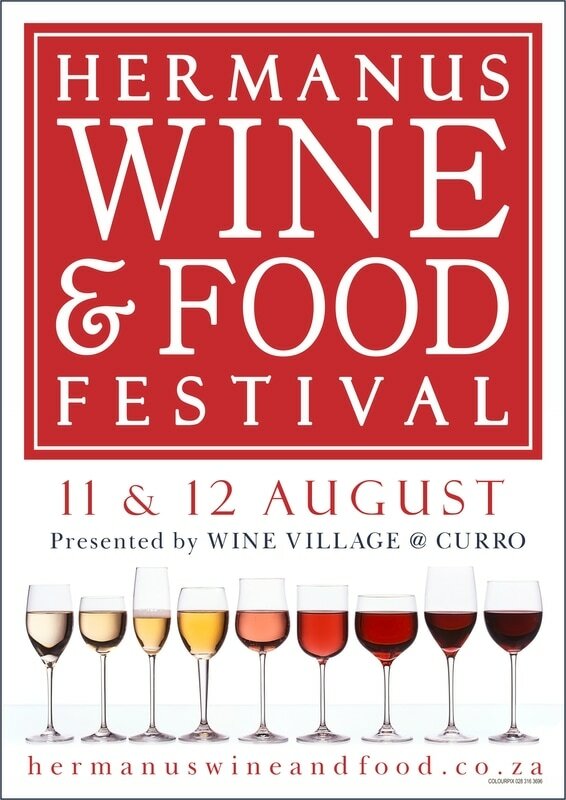 Wine Village - Hermanus is proud to once again host the Hermanus Wine and Food Festival. Voted one of South Africa’s Top 10 Wine Festivals, this celebration brings together more than 65 of the premium wine and craft beer producers in South Africa. 10,00 people over a period of 3 days. The festival prides itself on celebrating incredible South Africa wines, delicious craft beers, fresh and tasty produce and gourmet foods. The atmosphere is electrifying and contagious with everything from gourmet food trucks, beer on tap and kids entertainment for the duration of the festival. As always, children are more than welcome and will be entertained in the special activity centre where they can play and partake in activities for free while you explore the offerings on show. 2016 Promises to be a mouth-watering journey in the presence of great music, friends, incredible foods and luscious juicy wines. Join us this year as we celebrate 20 years of excellence, quality, superior craftsmanship, unsurpassed client service and the true meaning of local is lekker. All the wines will be available for purchase at cellar door prices from the Wine Village. This is a unique opportunity to extend your wine collection. Sip and savour some of the most magnificent wines in South Africa in the Wine Marquee and make new friends. We hope to see you there for a fun-filled and informative time. Tickets will be available at the Wine Village and at the door at R150 per person. We have seen the Walker Bay region grow from 6 producers in 1998 to more than 70 producers in 2016, and still growing. We have sent wine to every continent on earth, even to Antarctica; and we offer more than 1600 labels of South African wines in the large store. 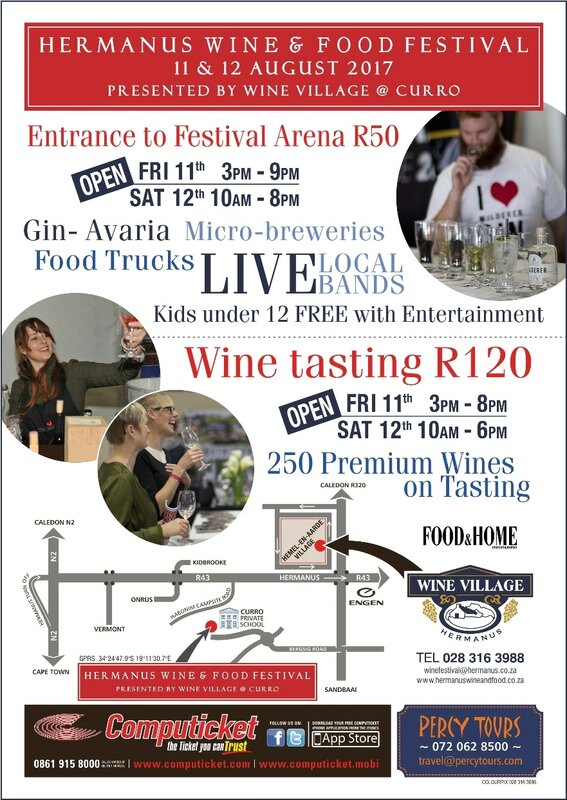 The Hermanus Wine and Food Festival is at the Wine Village, Hemel-en-Aarde village, Sandbaai, Hermanus - a gateway for visitors into the award winning wines of the Overberg. The Overberg wine region produces some of the most sought after wines in the country and you are invited to browse through the wine show, appreciate, delight in and sense the fruit of the vines, and discover your own favourites. Experience the wonderful world of our local chefs, cooks and yummy food makers in the food court. Specialities of our region, from lip smacking snacks to gourmet meals on the go, a delectable journey in the presence of great music, friends and family. The winemakers, producers and chefs have become our friends and are part of our wine family – come and meet them, taste their magnificent products. 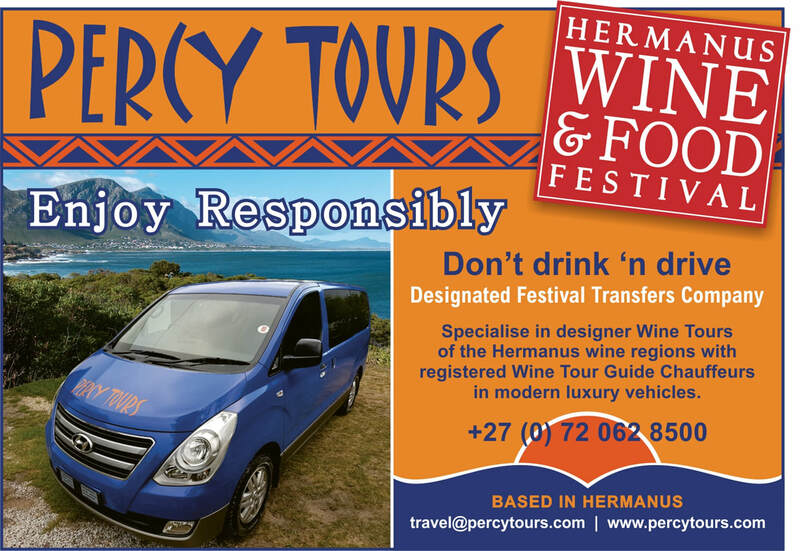 The Hermanus Wine and Food Festival promises to be a vino-experience where you will meet new friends, discover new wines and find that whales are not the only reason for people to visit Hermanus. As always, children are welcome and we have a special activity centre for them to play in and be entertained while you explore the offerings on show. Sip and savour some of the most magnificent wines in South Africa in the Wine Marquee. Entrance is a mere R150 per person. This includes a glass and informative booklet on all the producers. Please note that you must be 18 years or older to do wine tasting. Please remember to enjoy your beverages responsibly.